Death Rides A Horse (1967) is an effective revenge tale and an unlikely buddy film in one. The story involves a young man (Bill, played by John Phillip Law) who seeks to mete his own personal justice upon the men who raped his mother and sister and brutally killed both of them, along with his father, when he was a boy. 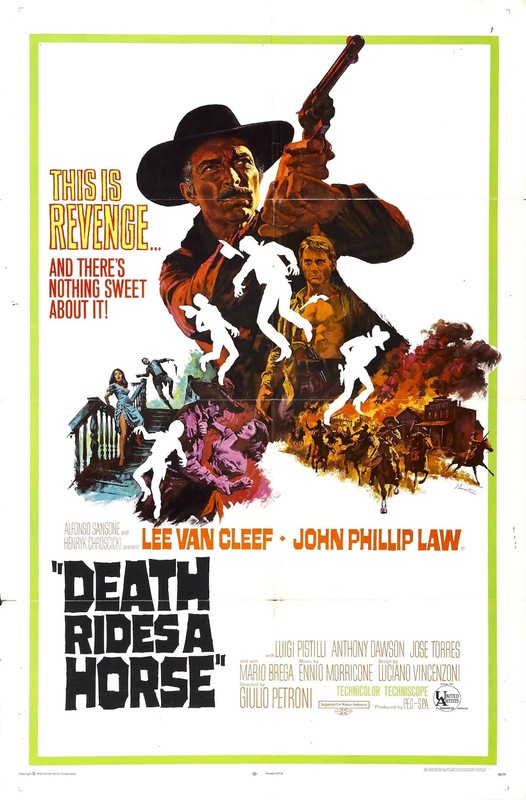 Lee Van Cleef plays Ryan, an ex-outlaw, out to kill the same bandits that Bill is after, for money he was cheated out of. The two actors compliment each other well—Law's chiseled good looks and his character's impetuousness paired against Van Cleef's gleeful grin and his character's sarcastic wisdom. Both men are crack shots and in the absence of Bill's birth father, their eventual alliance takes on a father/son like relationship. DRAH is a bit too long and a bit rough around the edges, but it features one incredibly memorable shootout ("Piano player, hit three notes! "), the charisma of its two manly leads is strong, and the score by Italian Western genre mainstay Ennio Morricone is a standout.